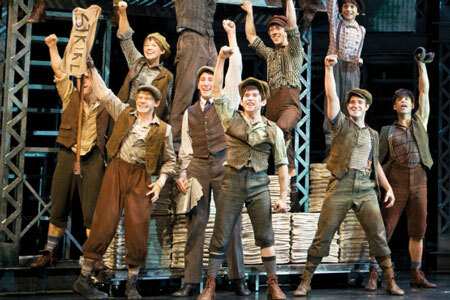 As a writer, it would be difficult for me to separate my Broadway experience with Newsies from the countless hours I spent as a little girl being absorbed by the film version of Newsies. As the story of newspaper boys at the turn of the century who decide to stand up to juggernauts of American business, Newsies has always been billed as a modern David and Goliath of sorts. And while I may never be able to adequately explain why I was so enamored with a singing, dancing Christian Bale who could neither actually sing nor dance, Newsies shall forever hold a place in my heart. So I had unrealistically high expectations for this show. With a background in theater, I am well aware that stage versions of shows can vary drastically from their film counterparts. 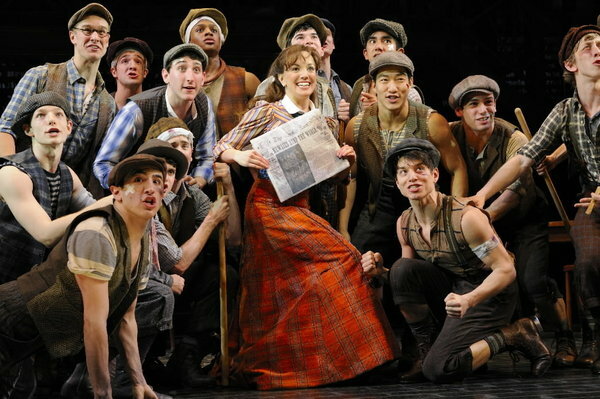 With all these things in mind I ventured down to the Nederlander Theatre on July 07th with a not-so-secret wish in my heart to fall in love with this new incarnation of Newsies. There was little to be bored with in the course of the show. I am quite sure a smile bloomed on my face from the opening moments of “Carrying the Banner” and stayed all the way through the end of the first act. It was nothing less than pure joy seeing the songs I had loved as a child being performed so beautifully on stage. There are some notable changes in lyrics and arrangement that any die-hard fan will notice. The lyric changes I can mostly forgive; I suppose it gauche to hurl insults at New York City while you are soft-shoeing on one of their stages. Most of the arrangement changes weren’t a big deal either, with one notable exception—which I will get to later. The choreography was fantastic, as was the talent on the stage performing it. There was one point where a remarkable dancer did a beautiful set of fouettés during a dance break, which drove the audience nuts. By the end of the first act I was as fully immersed in the stage show as I had been with the movie. The second act was a bit slower and there were not as many familiar musical numbers. It had things that I generally don’t care much for, but that others probably enjoyed: a romance in full bloom, a “shocking” plot twist, and a small cheer for female empowerment. Don’t get me wrong, love is awesome, life can throw strange twists at you, and I’m actually a closet feminist, but I didn’t want or need any of these things in my Newsies experience. I’m not sure if my reaction is because this is where the show really diverged from the film or if I’m just a grumpy curmudgeon. Still, there were differences in the first act that I quite enjoyed. Medda was a large black woman who sang a jazzy soulful number as opposed to the ditzy Swede in the film. The reporter who follows the newsboys’ struggle is an eccentric, insecure female, as opposed to the self-assured, cool paper man. The audience never gets to meet Davey and Les’s family. Jack is not just a teenager full of angst and a dream for the west, but also a talented artist. All of these things I accepted and understood, but they had consequences I didn’t see coming. 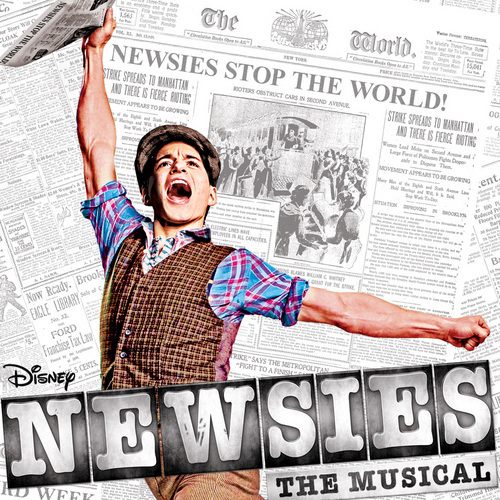 The biggest issue for me is how much adapting Newsies for the stage changed the character of Jack Kelly. As the second act went along, I was waiting patiently for “Santa Fe,” the song that defined who Jack was and what he wanted in the film. It is shortened into a pretty meaningless prelude for the stage. I realize that it had to be because we didn’t have the back story needed to explore Jack’s character in the same way. Nonetheless, I was disappointed. It made Jack less accessible; I didn’t feel as connected to him. Also, it felt that this song was clipped to make room for the chintzy duet with the reporter love interest. Even now when I sit down and think about the character of the reporter I am confused. Maybe someone really wanted there to be a strong female character for little girls to identify with in the show. I hope not, because if that’s what they were going for they failed. While we all identify with insecurity, the character is done in such a way that it actually breaks my suspension of disbelief at times. She was too sarcastic, too jaded, and too fast-talking for me to accept her in this cast of characters. The actress wasn’t bad, and I’m not faulting her performance. The character itself just didn’t do it for me. I didn’t need a female to draw me into the story as a child and as an adult it just seemed like a cheap gimme. After all that, it may sound like I didn’t enjoy Newsies, which couldn’t be further from the truth. It is still basically the same tale it was when I was a kid, just modernized in both good and less good ways. It’s also worth mentioning that some of the themes feel very relevant to the times we live in, particularly the power even the poorest of people have when they decide to stand together against what they consider injustice. While I have to admit it wasn’t the love I was looking for, it was still a damn good show: the talent was excellent, the sets innovative, and the nostalgia intense and endearing. I’d watch it again even though it means cramming myself into the teeny tiny theater seats and leaving with a bruise on my shin from the laughable legroom they allot full grown adults. I imagine that anyone seeing the show for the first time, or who didn’t obsess over it as a child, would be over the moon about it as the entire audience rose to their feet for the curtain call (there was even a special cheer for the aforementioned dancer). For myself, I would give it a 4 out of 5—not the best show in the history of the world, but it was more than worth the price of admission. I feel like sometimes the things from our childhood get such a nostalgic boost that even the incredible can’t compete with them. I am so excited to go see it on Broadway!! I hope they don’t cnghae it from Papermill, I am just waiting to hear who will play Jack Kelly since the guy who played him at the Papermill is currently in another show on Broadway.